Through USGBC. Blogspot. com which I consider the more authentic blog experience. The USGBC Blog was launched on February 9, 2011 with a post titled From Cutting Edge to Common Practice: How Green Building Rating Systems Contribute to Energy Efficient Building Codes. Since then, it publishes from 7 to 21 blog articles per month, or approximately 3 articles per week. Topics focus on green building, energy efficiency, building codes and other topics related to green building. 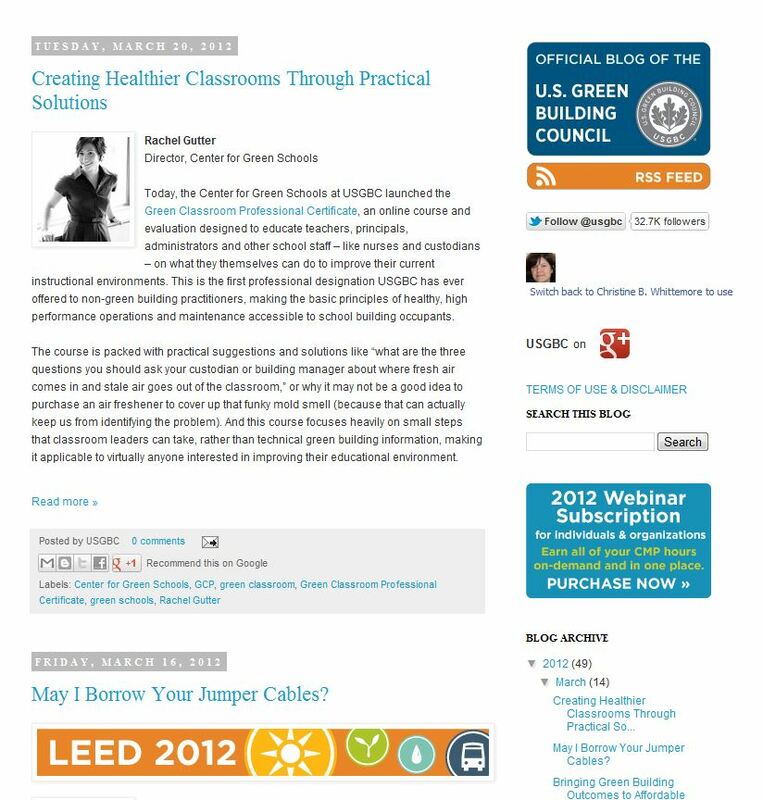 You'll notice in the blog's sidebar encouragement to follow USGBC on Google+ and Facebook. It highlights a 'what we're reading' section which highlights related blogs and HuffingtonPost references. I like that 'Recent Comments' appear. What's most wonderful about the USGBC Blog is the wealth of USGBC voices participating. I counted at least 15 different contributors, many of which are directly involved in USGBC, as well as others. What a wonderful way to include breath of perspective! Add an email subscription option for those wanting email updates. Include in the blog sidebar a listing of the blog labels or categories. You include them in each blog article, but don't offer readers the means to easily explore the rich content published. With so many authors involved, why not list the authors in the blog sidebar or offer a page detailing them all? I notice comments, but I don't see any responses back from USGBC blog writers or editor. This would contribute depth and perspective. Given the wealth of perspectives, I would love to read an 'about us' or mission statement page detailing the overarching purpose of the blog. Great job, USGBC Blog sharing perspective and insights on green building! I look forward to reading more. What do you like most about the USGBC Blog? Let me know in the comments.